A new study sheds light on the magnitude of microplastic pollution in our oceans. The study, published in open-access journal Frontiers in Marine Science, found microplastics in the stomachs of nearly three out of every four mesopelagic fish caught in the Northwest Atlantic -- one of the highest levels globally. These findings are worrying, as the affected fish could spread microplastics throughout the ocean. The fish are also prey for fish eaten by humans, meaning that microplastics could indirectly contaminate our food supply through the transfer of associated microplastic toxins. "Microplastic pollution has been in the news recently, with several governments planning a ban on microbeads used in cosmetics and detergents" says Alina Wieczorek from the National University of Ireland, Galway and lead author of the study. 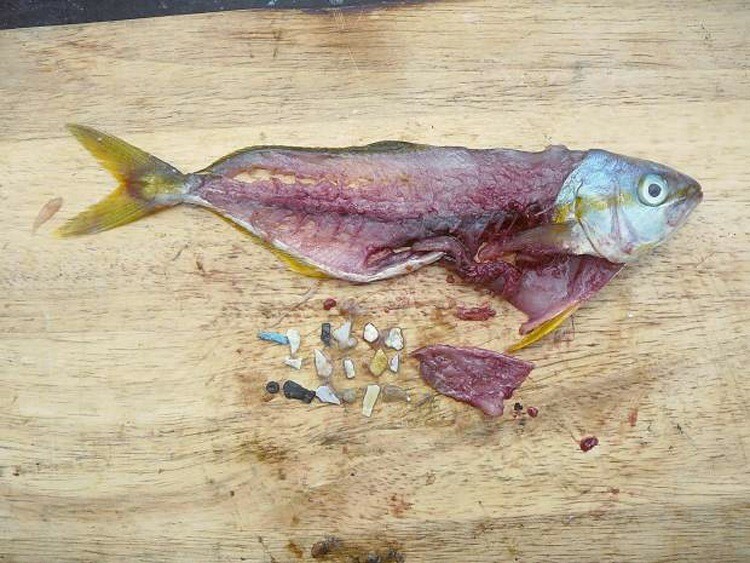 "The high ingestion rate of microplastics by mesopelagic fish that we observed has important consequences for the health of marine ecosystems and biogeochemical cycling in general." Microplastics are small plastic fragments that have accumulated in the marine environment following decades of pollution. These fragments can cause significant issues for marine organisms that ingest them, including inflammation, reduced feeding and weight-loss. Microplastic contamination may also spread from organism to organism when prey is eaten by predators. Since the fragments can bind to chemical pollutants, these associated toxins could accumulate in predator species. Mesopelagic fish serve as a food source for a large variety of marine animals, including tuna, swordfish, dolphins, seals and sea birds. Typically living at depths of 200-1,000 meters, these fish swim to the surface at night to feed then return to deeper waters during the day. Through these vertical movements, mesopelagic fish play a key role in the cycling of carbon and nutrients from the surface to the deep sea -- a process known as biogeochemical cycling. This means they could spread microplastic pollution throughout the marine ecosystem, by carrying microplastics from the surface down to deeper waters, affecting deep-sea organisms. Despite their important role in marine ecosystems, mesopelagic fish have been relatively understudied in the context of microplastics. To investigate this further, Wieczorek and colleagues set out to catch fish in a remote area of the Northwest Atlantic Ocean: an eddy (whirlpool) off the coast of Newfoundland. As the researchers were extremely careful to exclude contamination with fibers from the air, they are confident that the fish had ingested the fibers in the sea. Finding high levels of fibers in the fish is significant, as some studies investigating microplastics in fish have dismissed such fibers as contaminants from the lab environment, meaning their role as a pollutant may have been underestimated.